SUGAR LAND, TX— The Skeeters today announced that they’ve signed former Major Leaguer Josh Prince as a player-coach for the 2019 season. Along with his playing duties, Prince, who’s set to appear in his 11th professional season, will serve as the team’s hitting coach. 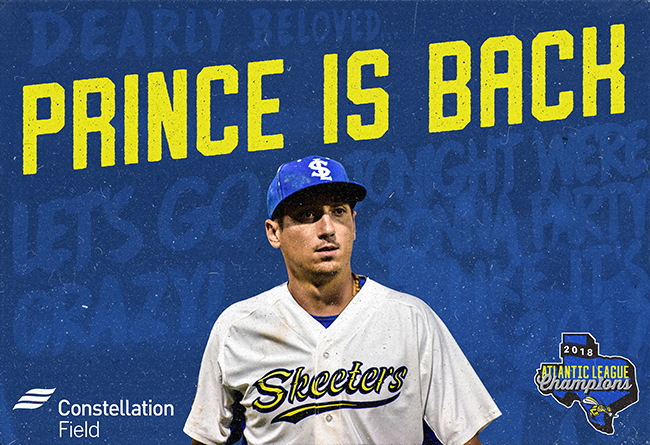 Prince, 30, returns to the Skeeters after appearing with the team during its run to the 2016 Atlantic League Championship and in 2017 as well. He spent the 2018 campaign at the Double-A and Triple-A levels in the Arizona Diamondbacks system, hitting a combined .282/.385/.407 with six home runs, 37 RBIs and 12 stolen bases in 104 games. Prince holds the Skeeters all-time career record for stolen bases (79) and ranks among the top 10 in several other categories, including walks (152, 2nd), runs (133, 4th), games played (218, 6th) and hits (197, 9th). The native of Lake Charles, La., set the Skeeters single-season record with 55 stolen bases in 2017. Prince owns a .250 average with 16 home runs and 77 RBIs in his tenure with the Skeeters. He first appeared in the Atlantic League in 2015 with the Bridgeport Bluefish. The Milwaukee Brewers selected Prince in the third round of 2009 MLB Draft out of Tulane University, where he tied for the NCAA Division I lead with 48 stolen bases as a junior in 2009. He also spent a collegiate season at the University of Texas. Prince made his Major League debut with the Brewers in 2013, appearing in eight games and going 1-for-8 with a double and three runs scored. He owns a career .254 average and .705 OPS to go 38 home runs, 250 RBIs and 341 stolen bases through 1,072 games at the professional level. He’s made 335 of his professional appearances at shortstop, 269 at second base and 235 at center field, while also appearing at third base, left field and right field. Prince joins as IF/C Albert Cordero, IF Alvaro Rondon and OF Tony Thomas as the Skeeters’ first four player signings for the 2019 season.